Norman Lebrecht's book may may have bitten the dust. But there is always Alex Ross' new magnus opus and much more beyond if you are looking for words on twentieth-century music. 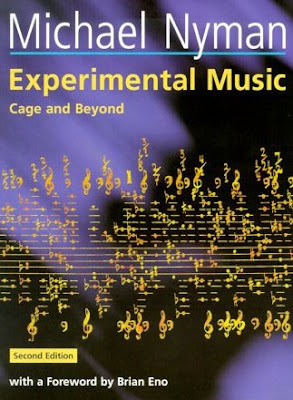 My header image shows a personal favourite music, Michael Nyman's Experimental Music - Cage and Beyond (CUP ISBN 0521653835). It was written in 1974, and although the 1999 edition didn't update it there is a new, and valuable, discography. Elsewhere Mark Grant recommends Albert Glinsky's Theremin: Ether Music and Espionage, (University of Illinois Press ISBN 0252025822) while on these pages composer and violinist Elaine Fine argued the case for Peter Conrad's Modern Times, Modern Places (Knopf ISBN 037540113X). I have recommended Paul Giffiths' A Concise History of Western Music (CUP ISBN 0521842948) to several readers, and fellow blogger Garth Trinkl bought it, and confirmed that the chapters on twentieth century music are thought-provoking. Nicholas Kenyon's excellent 1981 book The BBC Symphony Orchestra (BBC ISBN 0563176172 OP) is the best guide to the golden age of new music in 1970s London under William Glock and Pierre Boulez. The appendix listing first performances is a who's who of twentieth-century music. How ironic that it was Kenyon himself, as director of the BBC Proms, who later masterminded the transition from the riches of Boulez to the wretchedness of Ball. William Glock was controller of music at the BBC from 1959 to 1972, and his autobiography Notes In Advance (OUP ISBN 0198161921 OP) paints wonderful portraits of musicians from Igor Stravinsky to Elliott Carter. I have quoted him here on Bruno Maderna. Glock championed the music of Elisabeth Lutyens among others, and she features in the invaluable 1994 The Pandora Guide to Women Composers by Sophie Fuller (Pandora ISBN 004409362), together with Elizabeth Maconchy, Judith Weir, Thea Musgrave and other path regulars. The very positive response to my recent post on the British music champion Maurice Miles, and to my webcast of Gerald Finzi's Cello Concerto, confirmed that interest in twentieth century composers extends well beyond the fashionable few who now feature at the BBC Proms and over on Sequenza21. If you want to explore beyond the fashionable few, here are two titles that you won't see mentioned elsewhere. Both are out of print, but well worth searching out. Peter J. Pirie's The English Musical Renaissance - Twentieth Century British Composers & Their Works (Gollancz ISBN0575026790 OP) does what it says on the can, but doesn't bang on it. It was written in 1979, and takes the story up to Peter Maxwell Davies. Good coverage of composers who should be better known, including Frank Bridge (who was a major influence on Britten), Percy Grainger, John Ireland and Peter Warlock. My other recommendation is The Music Makers - The English Renaissance from Elgar to Britten by Michael Trend (Weidenfeld ISBN 029778403 OP). This covers the same period as Peter Pirie's book, but read it for portraits of characters such as Samuel Coleridge-Taylor, Rutland Boughton (I feel a path coming on - see below), Ethel Smyth and Lord Berners. Their day will come, meanwhile other book recommendations are very welcome. Now playing - the original Hyperion vinyl LPs of Rutland Boughton's opera The Immortal Hour. This magical work is a 'choral drama' in the style of Wagner. Everything about it is extraordinary. It became a major commercial success in London's West End between 1922 and 1932. The libretto is by William Sharp (1855-1905) who transcended his gender and wrote under the name Fiona Mcleod. The first performance of The Immortal Hour was at Boughton's newly founded Glastonbury Festival in 1914, and the Festival went on to become a preeminent rock event. Most extraordnary is that, despite this high profile, The Immortal Hour has been swallowed in the mists of time. But thankfully the Hyperion version lives on in a budget priced CD re-issue. If you don't know it, you are missing something very special. Now read about a classical label whose owner DJ'd at Glastonbury. I have a theory about why The Immortal Hour fell out of favor : World War II. After the War, nothing as fantastical could appeal to a war weary public. Realism did not allow for it. The 20th Century truly began with Nagasaki. After that anything remotely Romantic seemed frivoulous. Nothing "Angry young men" or "National Health" about it. That was truly sad. Boughton's music has an expressionistic genious about it. I well remember my first encounter with "The Immortal Hour" from a Toronto performance in 1991 by Opera In Concert. I immediately bought the HYPERION CD. Of course, excerpts of it were always popular with choir (c.f. The Fairy Chorus as recorded by the Orpheus Choir and Sir Hugh Roberton).This is magnificent music. And, atmosphere-wise, it is more of a "lost" Celtic tradition than anything Tolkien could have ever written. Garth Trinkl points out that Peter Conrad’s Creation: Artists, Gods, and Origins (Hardcover) goes on sale in the US on November 1. Two books I've read in the past couple of years have been incredibly thought-provoking, for both my own compositional work, as well as for my listening enjoyment and appreciation: "Oceans of Sound" by David Toop and "Temperament: The Idea That Solved Music's Greatest Riddle" by Stuart Isacoff. In "Ocean of Sound" one meanders through altered worlds of silence, speed, sound and the juxtaposed perfumes of distant and different aesthetics and realities. As one reads, one actually begins to gather form and gesture from the ether in a new way --- one hears frequencies and notices patterns which were already there, but which one had simply missed before. The book gives a listener new contexts in which to discover 'music', and it offers the composer a rich universe in which to find and illuminate new and different patterns in his or her creative path. The "Temperament" book has been called 'flawed' by some (perhaps the author has a bit of a dense writing style and goes off on one too many overgrown paths for some readers), but it explores in a humorous manner the histories of the temperament, tuning, listening to and performing of music from a variety of sociocultural perspectives. It made me wonder, when I first read it, why I had taken certain musical events and 'lineages' for granted. Most importantly, it made me stop and think about how easy it is for historians, anthropologists and musicologists to say certain things, or write certain things in books, and thereby dictate the way people receive and assimilate their cultural information for hundreds of years. Sometimes it's not in what these cultural 'authorities' DO say, but in what, or whom, they leave out. It's lovely to occasionally discover how the other half lives (whether this be a matter of geography, gender, race, religion, perspective, time-period, you-name-it).